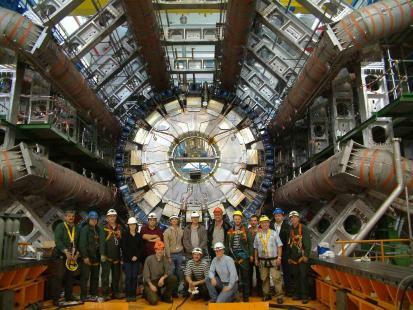 The ATLAS experiment is one of the four big experiments at the Large Hadron Collider (LHC) at CERN (Geneva, Switzerland). A collaboration of about 3000 scientists from all around the world aims at studying proton - proton collisions at very high energies and particle fluxes. New and exciting particles are to be discovered, deeper insight into the fundamental forces and structures of our universe to be gained. The experiment has been built and installed in Geneva in a joint effort over the last decade, has been thoroughly commissioned, and is capturing collison data since end of 2009. The Mainz group aims at using data recorded by the ATLAS detector to resolve fundamental questions such as the nature of dark matter (search for Supersymmetry), the origin of electroweak symmetry breaking (study of the Higgs boson), and the quest for a unified theory of all interactions (detection of physics beyond the Standard Model). We have made major contributions to detector and electronics design, in particular in the general area of the ATLAS Liquid Argon Calorimeter, as well as the readout and analysis infrastructure. 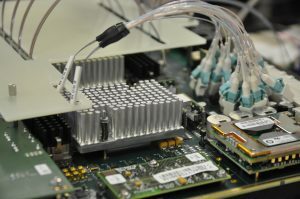 Along with physics analyses, the Mainz group is currently working on the maintenance, optimization and further development of the high speed trigger electronics.